The white pylon is so 1992, says Wind Tower Systems. General Electric today announced it will buy Wind Tower Systems, a move that could change the look, height and economics of wind turbines. Wind Tower has created something it calls the Space Frame Tower (see picture). 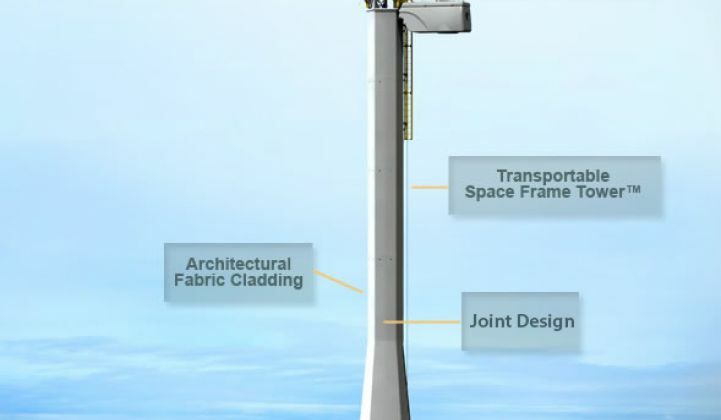 Unlike the sleek, white pylons that hold up most wind turbines, the Space Frame tapers as it goes toward the top. The structure, ideally, will let wind farms put turbines more than 100 meters off the ground. Taller towers will allow the industry to move to longer blades, which will allow a single turbine to produce more power. The turbine gets mounted on the pole by that crane at the top, called the Hi-Jack System. The structure, though, is really about economics. The Space Frame can be disassembled into smaller components that are far easier to transport than the dino-sized sections of steel pipe used on traditional wind turbines. Mobilization and de-mobilization can gobble up to ten percent of the cost of a turbine. Instead of 36 trucks being needed to transport all the necessary parts to a site, it only takes six. The Hi-Jack also lets wind farm owners repair a turbine right away, instead of waiting around for a crane to become available. Pylons are complex structures. Turbines weigh several tons and the spinning blades create tremendous, and irregular, forces. Commercial availability is slated for 2012. A few other companies are looking at ways of cutting the cost out of wind by changing the pylon. In Scotland, SeaEnergy Renewables has figured out a a way to mount turbines on top of the platforms used for oil derricks. (The company was started by execs who spent decades building the structures that drill for oil in the North Sea.) The platforms cost less because they require less steel and construction time is greatly reduced. If this movement takes off, wind could go down in price. The only losers will be the investment banks: they will have to change all of those ads that feature traditional wind turbines.